Machining is one of the most important manufacturing processes, which remove unwanted material in the form of chips from a workpiece. Material removal operations are among the most expensive; in the U.S. alone, more than $100 billion were spent on machining in 1999. These high costs put tremendous economic pressures on production managers and engineers as they struggle to find ways to increase productivity. Machining recommendations provided in this book cover turning since it allows removing more material per unit of time and consuming more power at the roughing operations than end milling, boring or drilling. Machining recommendations relate to cutting speeds, feed rates, and depth of cuts. Such recommendations depend on the workpiece material properties and the cutting tool material. Workpiece materials described in this book are the most commonly used grades of carbon, alloy, stainless, tool, and maraging steels. Cutting tool materials are cemented carbides, cermets, and ceramics. • Describes hardness, tensile strength, and machinability of steels-the major mechanical properties. These properties are taken into consideration when selecting machining parameters. 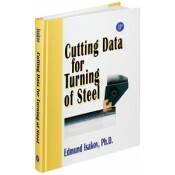 • Features machining recommendations for turning that provide the cutting speed values based on Brinell hardness numbers, the depth of cut, and feed rate in relationships with the type of steel. • Summarizes numerous calculations in five appendices.